I heard of the ‘list of favourite things’ concept a few years ago. It works like this. Without thinking too hard, write down twenty-five (fifty if you like) things you really love to do. Surprisingly, when you read the list back, you will find that most of the things you really like to do are either free or cost very little money. Close to the top of my list of favourite things to do is to sit down to read Vogue while sipping a decent cup of coffee. 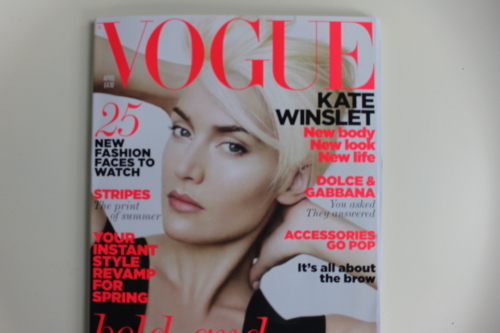 I buy a few other magazines every month but my absolute must have is always Vogue (British Vogue). In December I buy Vogue as usual. I also buy a further five or six magazines. I wrap them all individually in Christmas paper. In the days following Christmas I open them up and enjoy them (strictly one a day). They are a lovely post-Christmas treat. Bye for now as I am off to make a coffee and enjoy this month’s Vogue. Talk to you soon.